When I was a young boy I remember laboring hard by doing my rounds in the local neighborhoods trying to sell the various popcorn flavors we used to fund our local scouts. I hated it. And rarely did I get many sales. So instead I lobbied my father to sell for me at his offices in Boston. I never had to work at popcorn selling again. The Scouts taught me much about efficiency. But I hadn’t seen the Boy Scouts popcorn in long time. In fact the last time I remember seeing the popcorn offered by the Boy Scouts it came in a tin. 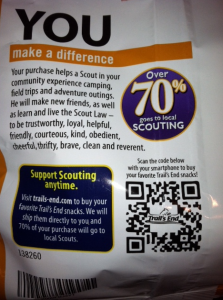 So I picked up my first bag of kettle corn Boy Scout popcorn today (in partner with Trail’s End) and you wouldn’t believe my surprise when on back of the zip closed bag a QR code was staring back at me on their product packaging! Who knew the Scouts were so technologically advanced? 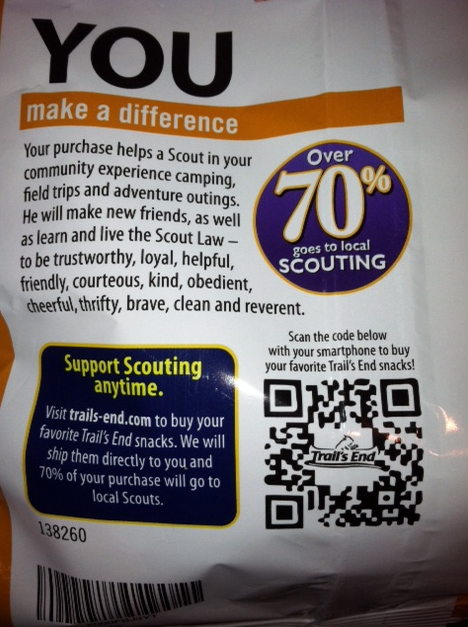 On the back of the bag there is a large, clear QR code with the Trail’s End logo in the center, just asking to be scanned. Already this sets the QR code up for success. The call to action is clear and indicates the purpose in scanning the code. It’s as if the QR code is saying “If you want more of your delicious popcorn all you have to do is scan me! It’s THAT easy!” This is close to a perfect QR code use. For me personally, I know that after just one bite of that kettle corn I would want more, and instead of tracking and then chasing down a local boy scout all I needed to do was scan the back of the bag and ship more of this delectable popped corn to my house. That should surely drive some internet sales. Genius. Here is where the first (and only) issue arises. Once I scan the code I am directed to a desktop website rather than a mobile website. This is sure to turn some people off, life myself. 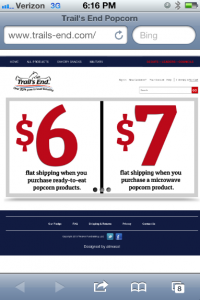 A desktop website is hard to navigate, particularly when you are attempting to make a purchase. So here, the only improvement I would make to this code/landing page is to ensure the page is mobile-optimized, especially the check out phase. The content of the site however is actually quite good. 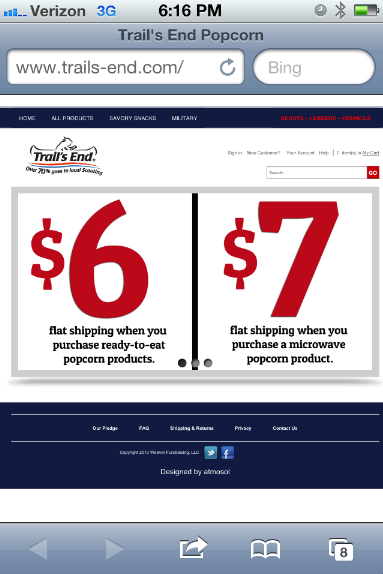 In fact what stands out right away are the deals and specials that are available if you order online, and they scroll across the screen. 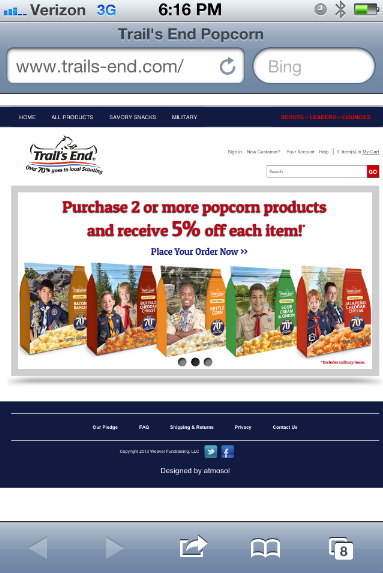 The first one gives you 5% off your order, another gives you flat rate shipping no matter the size of your order, and the last one lets you donate to a Support Our Troops cause where your donation is given to the local Scouts organization and popcorn is sent to the troops stationed overseas. These deals and specials are sure to help drive sales once someone scans the code, and particularly because they are so clear and the focus of the page. The Boy Scouts, through Trail’s End, have done a great job with the technical aspects of their code as well as the function and purpose. This is a great case study to learn from. Your code or usage doesn’t need to be anything outrageous or ultra creative (though that is often better), but as long as it makes sense and is purposeful you can have a successful QR code campaign. To make your campaign and management run smoothly and make everyone’s life easier, be sure to check out our platform here. 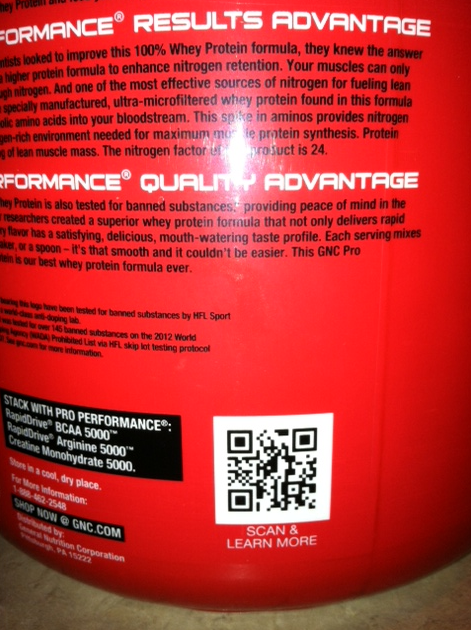 Most large companies these days have jumped on the QR code bandwagon, and in general this is a good thing. The QR code is a great addition to most advertising campaigns, marketing material, or product packaging, but often times even these large companies with all their massive budgets and intelligent human capital fail in their QR code usage—or at least discourage the potential of such a campaign. 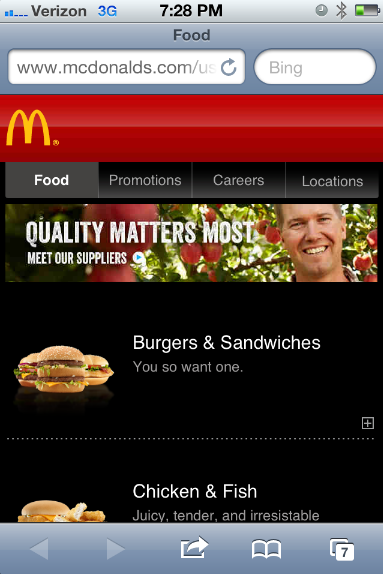 McDonalds is no different. – Making the decision to put it on all of their product packaging. – Codes are bright and generally stand out. – They include a call to action. – They are clear, have a low density, and are thus easy to scan. 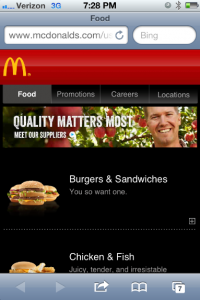 – A very well made, easy to use, good looking and information packed mobile optimized website. – Whether or not they are using analytics to track their codes; who is scanning them; when; why are they scanning etc. – Whether their codes are dynamic codes or not (can be changed after publication). – Their call to action is incredibly lame and unlikely to convince people to scan the code. – Their mobile optimized site is all of the good things I mentioned above, but it is also lacks excitement and engagement. As you can see McDonalds has done most of the technical QR code best practices very well, but where they lack, and where their biggest issue exists, is in their engagement and more creative side of the QR code best practices. It is one thing to have these technical side mastered, but if you want people to scan your code, and interact with your brand you need to master the creative side as well. 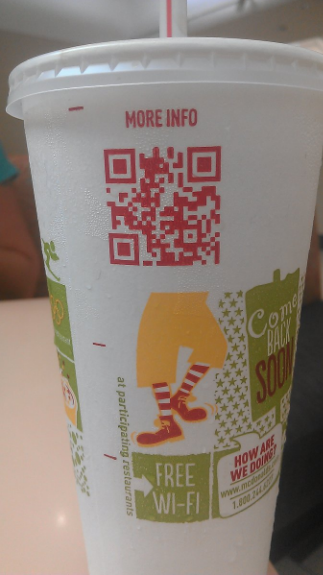 What McDonalds should do here instead is come up with a more interesting reason for people to scan their code. Perhaps by offering deals, or creating some sort of game or app for free, a contest of some sort, or anything else that their marketing department can come up with to help drive brand loyalty or increase sales. The technical side of this is easy to accomplish, but the creative part takes some thought. Don’t waste your resources or time implementing a QR code campaign if you aren’t going to do both parts well, otherwise there is little point. For help in mastering all the technical issues and management of your QR campaigns though, the Qfuse platform is sure to help. Much can be learned from looking at real life examples of QR code campaigns. Often times if you scan a code you will quickly learn what not to do, sometimes you might even learn what you should do, but at worst these examples should help jump start your brainstorming about how you might be able to benefits from your own QR code campaign—but of course since you are reading this blog yours won’t have any of the problems I am so often pointing out. On a typical day I consume two servings of GNC protein powder; it keeps me full and helps ensure I keep my ripped frame. So I recently purchased one of the new GNC protein powders and noticed the QR code on the back, obviously I had to scan it. The final product was not nearly as good as the protein powder itself. The good news about this QR code campaign is that we can all learn what NOT to do when deciding to use QR codes, particularly on product packaging. Before I point out the parts of their QR code use that were poor they did do a couple of things right, or at least sort of right. First off the QR code itself is done well with low density and a nice border, ensuring a quick and easy scan for most smartphones. Good job. Second, they used a call to action to try and convince people to scan the code—though it wasn’t a very enticing one, so not sure how well it will work. The areas that we can all learn from are twofold. First, the call to actions says to “learn more, scan here” and then takes you to a landing page for the protein shake itself. Now this might be fine but for a couple of reasons. The protein packaging itself gives you most of the information that is contained on the landing page, so in that regards you are learning very little that you didn’t know. Also, we are talking about a simple protein powder; do you really think anyone wants to “learn more” about it than they already know? I mean they either already purchased it or are considering purchasing it in the store and standing nearby is a GNC employee. This is certainly not an ideal use for a QR code. 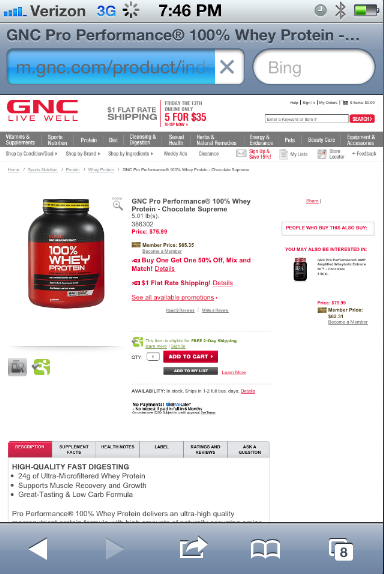 An alternative to this lousy QR code use could have been something like offering a coupon or free shipping if they purchase their next protein powder right there from the landing page, or perhaps they could use the QR code to advertise a special deal for a sister product to cross-advertise and help drive their online sales. This would be a much better use of a QR code as it would help drive sales, and makes scanning the code worthwhile for the consumer. Just make sure the call to action for the QR code explains what they will get from scanning the code. The other major issue with the code—and something I still see all the time for some reason—is that the landing page was simply their desktop website. This is really inexcusable at this point in time. Mobile makes up a large portion of all online traffic and therefore every business, particularly large ones who sell online like GNC, must have a mobile optimized website and landing pages. Attempting to use a desktop website, especially if you are trying to buy something online, is incredibly frustrating and you will likely lose many potential customers by doing this. So if you are going to use QR codes—or even if you don’t—make sure your mobile users are directed to a mobile optimized website. The small investment will be worth it. If you are going to use QR codes it is vitally important that you give the consumer a reason to scan the code, make it clear with a call to action, make sure the code is easily scannable, and make sure they will be directed to a mobile optimized landing page. In addition to these things you should also be using a platform that allows you to make changes to your codes on the fly, has tracking and analytics, and lets you manage all of your codes from one convenient place. The rise of mobile technology has come a long way over the past century, and though the technology grew at an incredibly slow rate for most of its existence it has now hit the point of exponential growth and doesn’t look to be slowing down anytime soon. This growth of mobile has led to incredible improvements in communication between individuals, massive wealth creation, market efficiencies, and has even helped as a tool and catalyst for recent revolutions and regime change. 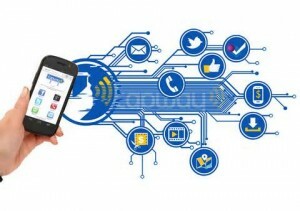 What this technology has also brought about is an almost limitless market for businesses both large and small to tap into and connect with their potential and current customers. As you will see from the fantastic infographic below (brought to you by Bestcomputersciencedegrees.com), the market that exists today and the potential for market expansion in the future is nothing but extraordinary. And if you are a business or organization it is about time you start looking at the mobile market as the future of your growth if you haven’t already. So take a look at this great infographic below and you might just have a moment of enlightenment, at worst you are sure to learn something you did not know before.